Longing to draw the field at the top of my neighborhood. Determined to draw it from every angle possible. Just simple line & wash drawings. It’s not really “my” field. It belongs to Mr. Whicker, whose farm sits on the other side of the road from the little field which grows, morphs, and molts it’s wheat a few times a year. I love this field. It was a drizzly day, a couple of weeks ago, when I drew this. Sitting in a chair, off the side of Silver Dapple Lane which runs down beside my field, doesn’t offer the same viewpoint as I have when standing. I’m going to have to learn to stand when I draw. Perhaps next time I will do just that…stand and draw on the same spot in the same direction as this, so you can see more of the field, not just the edges here. So you can see the road, Hastings Hill on the other side of the field, and then the further field and neighborhood beyond that. 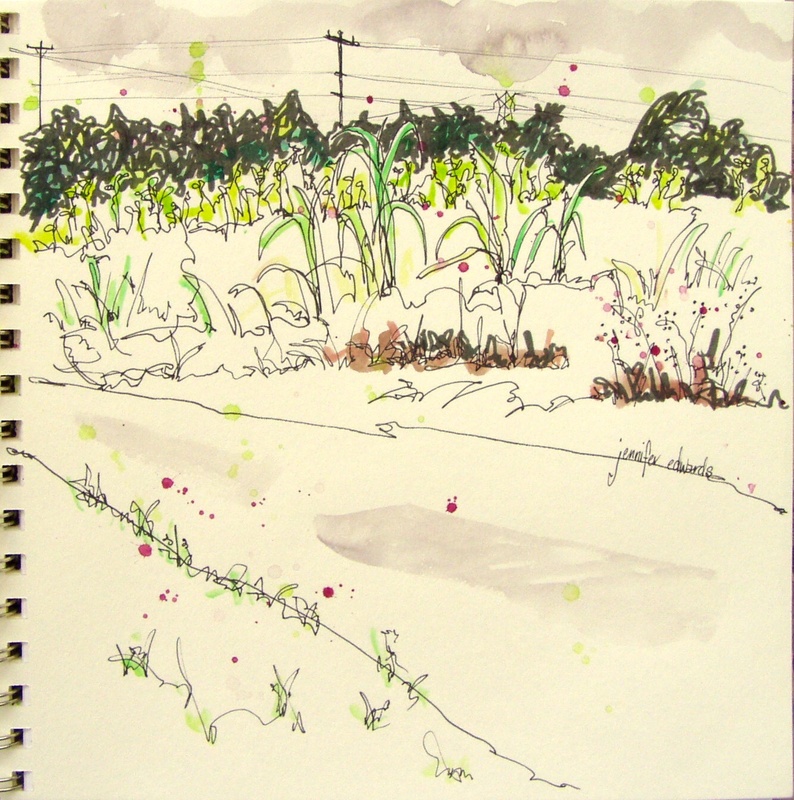 Be on the lookout for more Field drawings…I want to show you my field, as if you were with me walking by it, standing next to it, breathing it in. Yes…take us for a walk! This is wonderful! I am looking forward to this field trip, :). I do like your first sketch. And does not ‘Silver Dapple Lane’ sound like such a quaint little place? I like it. I like the telephone poles beyond the rise. Looking forward to seeing more. It’s strange how one little spot can catch the imagination. I like the sense of something beyond the hedgerow in this one!